Just like you change your wardrobe for summer, your bedroom “wardrobe” needs a little lightening up, too! 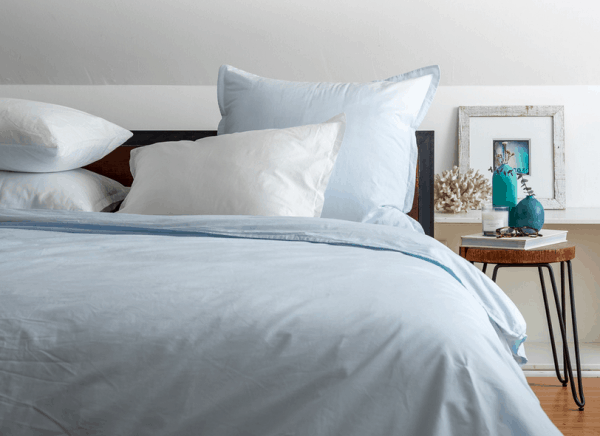 Here are ten easy summer bedroom ideas to get you ready for warmer weather. There are affiliate links in this post. You won’t be charged anything extra for using these but I’ll get a small percentage of any purchase you make which helps support my little blog. I appreciate your support! Thanks!!! Take off heavy comforters and blankets. I take off some pillows, too. I keep a throw because our kitty loves to lay on the bed and I don’t want fur all over. Throws are much easier to wash. Plus, when Bikeman turns the AC down I can pull it over me. But I do switch to a lighter color. We’re talking color and weight here. I have two sets of sheets that we use in the summer. (Just in case something comes up while our favorite set is in the wash and I don’t get them finished before night.) Our favorite look in the summer is WHITE! White sheets, white pillowcases, white (lightweight) blanket, and a vintage white chenille bedspread. Parachute provided me with some of these photos and have a great selection of luxury bedding. I also enjoy their post, especially the post about sleeping without a top sheet. Something I didn’t realize so many people did. 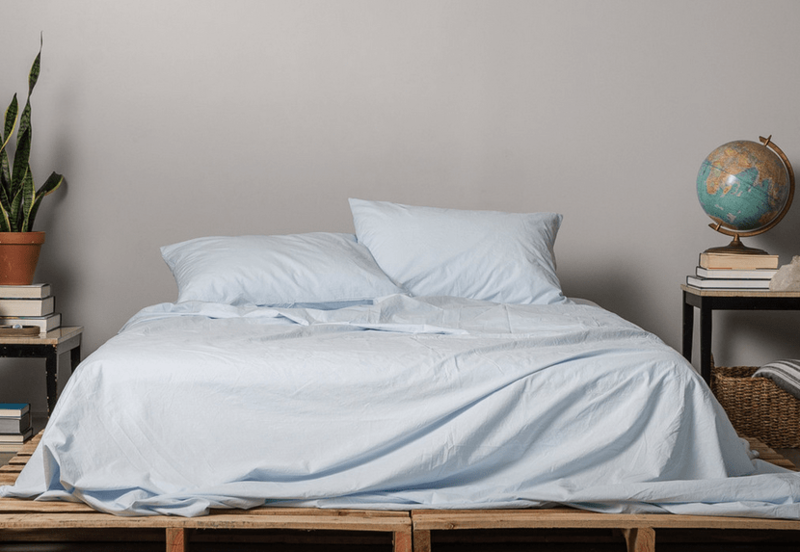 Our second set of sheets includes a vintage floral fitted sheet! I think two sheets with this pattern would be overwhelming. But one floral sheet is fun. I match it up with more white sheets and solid pillowcases. As you can tell, I don’t like matching, so I don’t usually buy sheet or comforter sets. If you need to sleep later I would recommend using a lighter color blackout curtain or shade. A while back we replaced our bedroom carpet with vinyl planks that look like wood. I still haven’t shared that on the blog but you can see what it looks like in our hall HERE. Most of the time we have rugs throughout the bedroom and hall but for the summer I take them up so I can enjoy the cool floor. We have a fan in our bedroom all year long, mainly for the background noise. But if you don’t it helps to have it going in the room even if it’s not pointed right on you. A vintage or vintage-style oscillating fan is even better! Take a good look at the tchotchkes in the room. Pack up some things and store them away ’til fall. Again, think light! If you’re lucky enough to have a fireplace in your bedroom fill it up with plants for the summer! There are a few houseplants that can get by with lower light. If you have a black thumb just get some nice fake plants… no one but you will know the difference! I have a pothos that does amazing with just the light from our one window. As I mentioned, we use a lot of white in the summer. But that makes it super easy to add color. You can easily add a US flag pillow between Memorial Day and the 4th of July, a striped crochet throw at the end of the bed, a floral print sheet, or colored pillowcases. 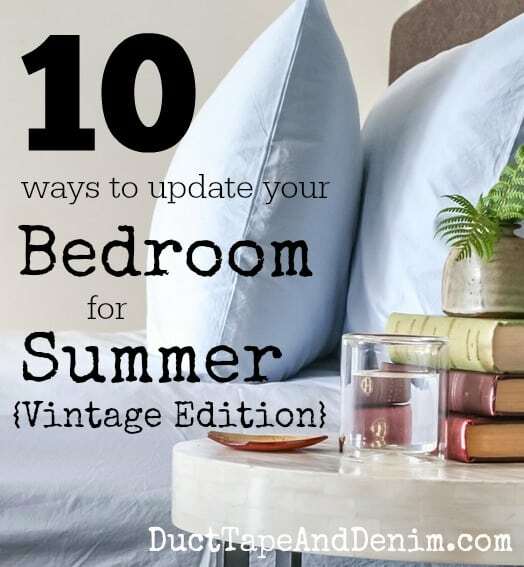 Pillows are a great way to use vintage fabrics, too! You can make a big statement with just a little bold fabric. 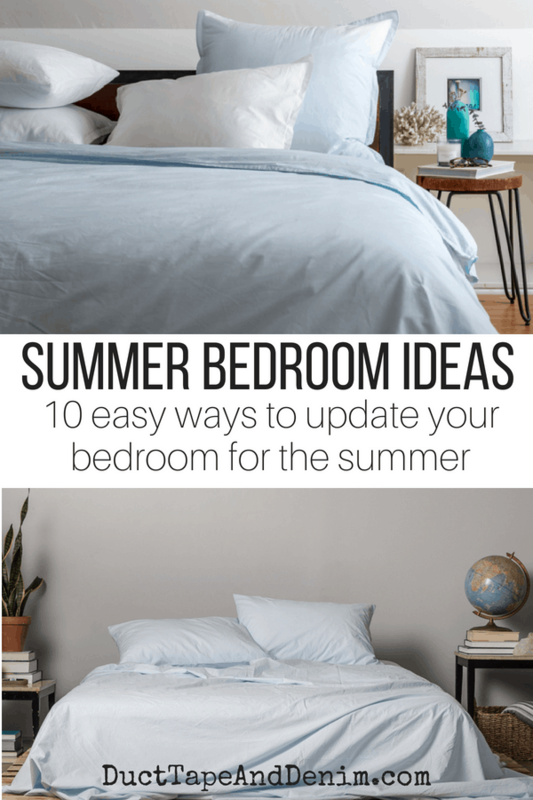 Do you update your bedroom for summer? Share your summer bedroom ideas in the comments. When I was growing up, my mother always had summer and winter curtains, s& w slipcovers, etc. I did for years but slowly got out of the habit altho I still tend to use lighter curtains in the summer; all the GREEN of the summer leaves darkens my house a lot. I love patriotic colors from May through August, then start with some fall colors. By the way, I finally found my first jewelry box to redo! A whole dollsr! What a great deal!!! Have fun with it. Great ideas! I have been looking for a new comforter for our bed for summer. Pinned. Great tips! I trade out my curtains in the summer too, but I actually put up heavier curtains to block some of the light at night and in the mornings. I just can’t sleep if it’s too bright out! I also feel like my house gets really musty in the winter with all the doors and windows closed all the time, so I clean the house from top to bottom, get the carpets cleaned and then leave the windows open. It makes the house feel so much cleaner and happier. Great tips! Thanks for sharing at the To Grandma’s House We Go DIY, Crafts, Recipes and More Wednesday Link Party. Pinned!